This easy crockpot chili recipe is made with lean ground beef, canned beans, and chopped vegetables. It is a hearty, nutritious, and complete meal that is perfect on a cold winter day. Double the recipe and take it along to the game or a party and serve it right from the slow cooker. 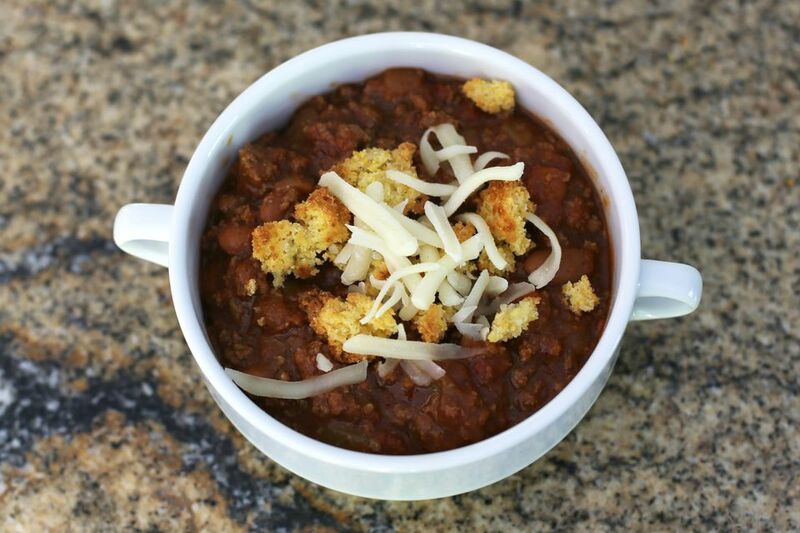 Accompany this tasty chili with hot, freshly baked cornbread or biscuits, or crumble cornbread over the top of each serving along with shredded cheese. For fun, set up a tray with a variety of garnish options such as sliced green onions, sour cream, guacamole, salsa, diced fresh tomatoes, minced red onions, crushed tortilla chips, and oyster crackers. In a large skillet, heat the vegetable oil over medium heat. Add the onions and saute for 2 minutes. Crumble the beef into the skillet and cook until the beef is no longer pink. Pour off any excess grease and transfer the beef and onion mixture to the slow cooker. To the crockpot, add the beans, tomatoes, chopped bell pepper, garlic, chili powder, cumin, black pepper, and kosher salt. Cover and cook on LOW for 7 to 9 hours, or on HIGH for 3 to 4 hours. Refrigerate any leftover chili. It will last for three to four days in the refrigerator. You can use leftover chili to make chili-filled biscuit cups, stuff bell peppers, top hot dogs, or fill burritos. You can also throw together a quick hot dip, cornbread-topped casserole, or taco salad. This chili freezes well; freeze in larger containers for a quick dinner or divide into serving-size portions for convenient lunches. It will keep at its best quality for four to six months in the freezer. Be sure to label the container with the date and contents. For extra heat, add a few tablespoons of finely chopped jalapeno peppers or another type of hot pepper, or add some cayenne pepper or crushed red pepper flakes. The recipe calls for pinto beans, but kidney beans, black beans, or white beans would all work well in this chili. Dried beans could be used in this recipe. They should be soaked and cooked separately before adding them to the crockpot. You can replace part or all of the ground beef with ground turkey, or swap out 1/2 pound of the ground beef with ground sausage. If you find yourself without fresh garlic, substitute with about 1 teaspoon of garlic powder. Chili is a great way to get picky kids to (secretly) eat vegetables. To include even more vegetables in this chili, add 8 to 16 ounces of sliced mushrooms to the skillet and cook along with the onions. You can also toss in about 1/2 cup of grated carrots to the skillet with the onions and beef, which will add a slight sweetness to the dish.